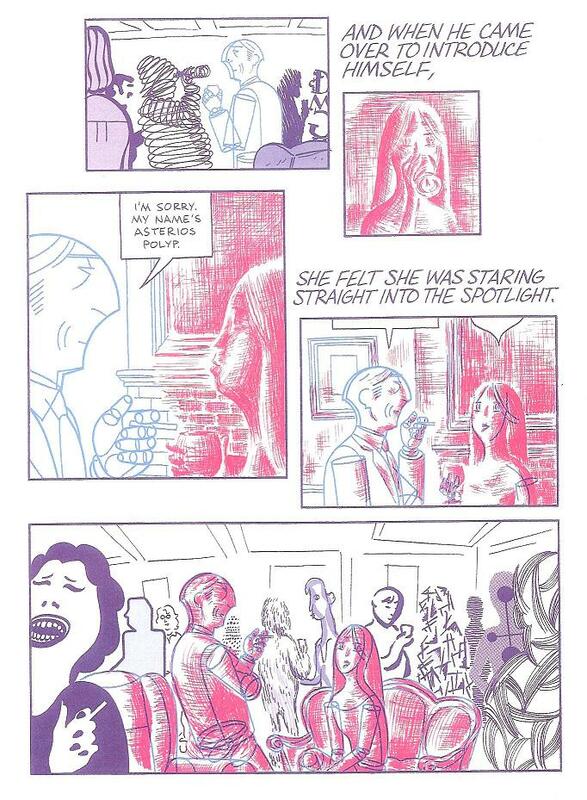 There is so much to say about David Mazzucchelli’s Asterios Polyp. Anyway, what you should get out of this is that he’s pretty famous. 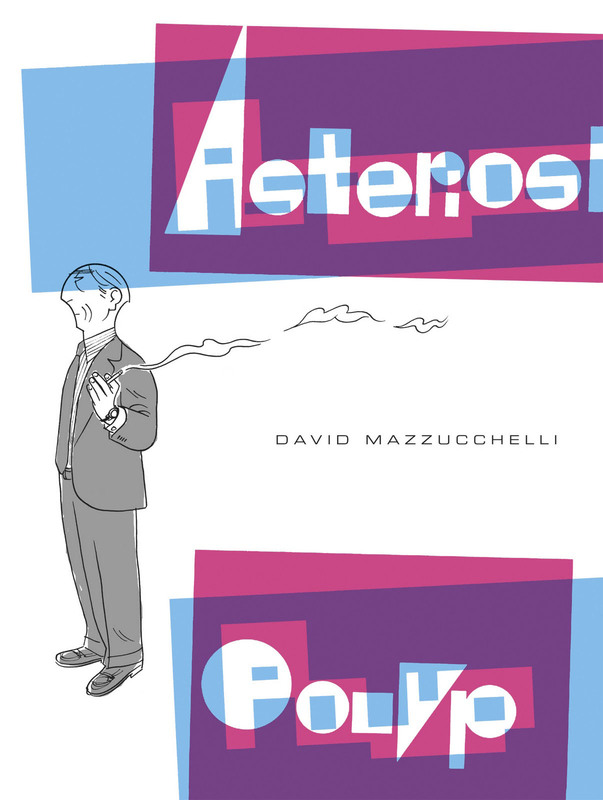 HOWEVER as Publishers Weekly so succinctly put it, “For decades, Mazzucchelli has been a master without a masterpiece.” So, as you can imagine Asterios Polyp was / is a HUGE deal and was long-awaited by oodles of fans. And now without further ado, I give you…. 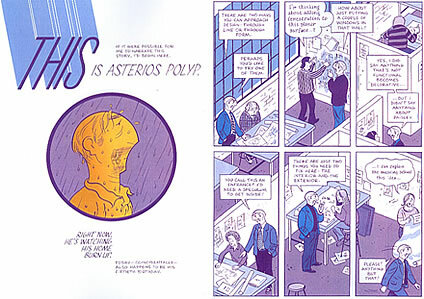 Asterios is the protagonist of this one of a kind graphic novel. He is a former professor of architecture and known as the “paper architect” (“that is the say he was an esteemed architect whose reputation rested on his designs, rather than on the buildings constructed from them. In fact, none of his designs had ever been built”). Basically, the novel is about his life, and more importantly, his relationship with his ex-wife Hana. The novel begins with Asterios awaking to his Manhattan apartment up in flames. Needless to say, our protagonist needs to start a new life both physically and mentally, and he does so by reflecting on his past life. He leaves Manhattan and take the Greyhound bus to however far it will take him with the amount of money he finds in his wallet. From there, he stumbles upon an auto repair shop and starts to work and live with a mechanic by the name of Stiff Major, and his clairvoyant wife Ursula and son, Jackson (who has an imaginary friend named Ronny). Anyway, by living a working middle class life, Asterios has time to reflect on his past and what exactly went wrong along the way. How people see through different realities. Anyway, I know it looks simple, but it’s really very beautiful how he physically shows how people may perceive themselves to look and how this visual characterization actually shows the unique qualities of people. Personally, this made me think that this could be a reality, maybe the way I view the world is totally different from how someone else views the world. For example, maybe I view the world as colorful, whereas the person sitting next to me views the world as curly. You know what I’m trying to go for here. 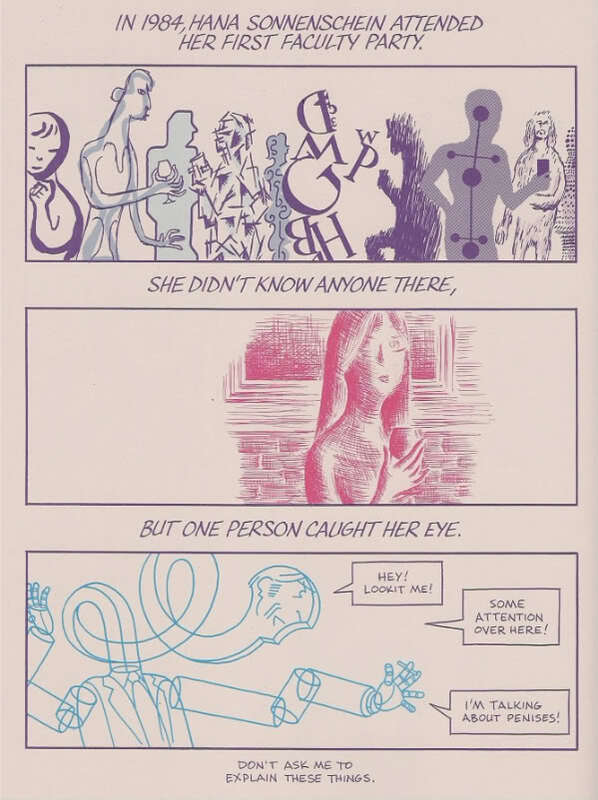 Anyway, Mazzucchelli keeps this motif through out the novel to show the differences between characters and this always shows up when Asterios and his wife, Hana have a disagreement. Also, Ignazio isn’t just the narrator of the novel, he is a constant presence in Asterios’ life. Asterios is haunted by the death of his twin and he feels that he is either being followed or watched (which leads Asterios to have his apartment and house constantly video taped so he can catch his twin in action, yet he never watches the videos). This presence leads Asterios to have dreams about his brother through out the novel, which are enlightening and strange, but overall, good for Asterios to finally have his long-awaited epiphany about life and love. Although all of this is intriguing, the best part of the novel is the depiction of the relationship between Asterios and Hana. (As an aside I absolutely love Hana’s character, love her) When the two meet, they seem to be complete opposites and in fact, they are (Asterios is an architect who has never built anything, Hana is an installation artist who does nothing but build things), but for some reason they end up being in the same reality. The two meld together and they have a great relationship, but it’s Asterios’ (of course) arrogance that ruins it. Although the two meld together, they are still very different people and they cannot see past their realities. In actuality, it is Asterios who cannot see past HIS reality whereas Hana puts up with his reality for waay too long. Same Reality / Staring into the Spotlight. Even though the two love each other, they see differently. Anyway, they divorce and thus begins Asterios’ downward spiral until his Manhattan apartment ends up on fire and he starts a new life. The images of Asterios and Hana before the divorce are really very lovely. The two are SO different and yet they are SO adorable together. Mazzucchelli paints and tells a beautiful story, and even though a lot of the things in the story are cliché and not so original, it’s still very heartwarming and the sentimentality behind it really does touch you. There are more pages, but you get the idea. The outcome of these pages? 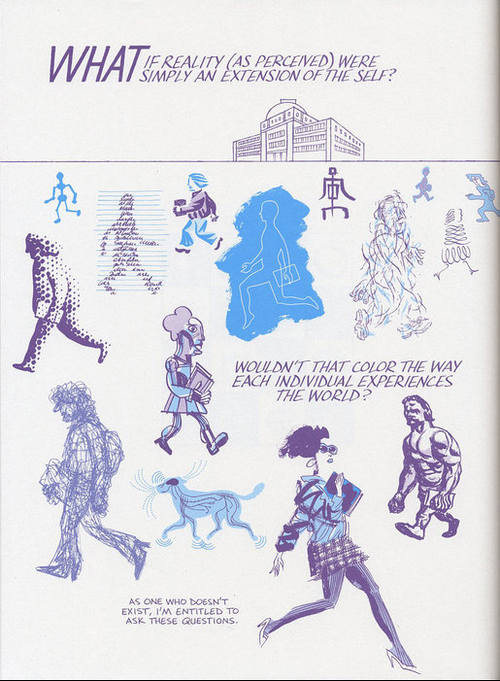 You are left with the same void that Asterios is left with…Mazzucchelli gives you these images and then leaves you with Asterios alone in a room dealing with his blister. The change from so many images to no images at all leaves you with the same feeling of desolation that Asterios is left with without Hana. 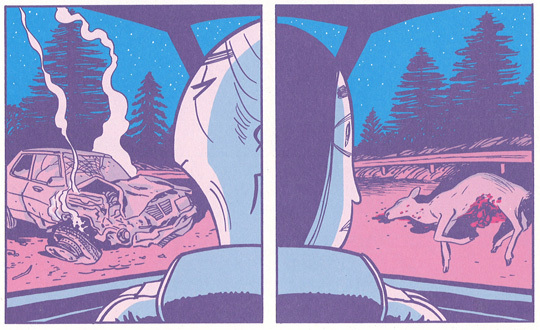 So, should you read Asterios Polyp? I give you an overwhelming YES. PLEASE READ THIS GRAPHIC NOVEL! It’s beautiful, it’s witty, it’s everything. There is even GREEK MYTHOLOGY. Hana is commissioned to work on the set design for a new production of the play, Orpheus, which leads to so many jokes it’s unbelievable. Asterios comments throughout the ordeal that Orpheus is one of the most overdone Greek Tragedies and yet, Mazzucchelli uses this tragedy in his graphic novel. He even has Asterios have a dream where he and Hana act out this classic tragedy! It’s amazing that he points out that the play is so overdone and yet, he NEEDS to use in his novel. And why not? It works, it’s funny, and it’s only natural to draw upon the past to prove a point in the future (which Asterios does throughout the novel to finally find himself at the end).